Not much is known about the Nemean Lion other than the story of Hercules (Greek mythology) and the first of his twelve trials. Most mythologists believe that the this is the figure representing the constellation of Leo. For a little-known monster of mythology, that's not a bad legacy. The Nemean Lion is named as such because he was a gigantic, ferocious lion with impenetrable skin that lived in a cave in the land of Nemea. Interestingly, while most other monsters in Greek mythology have a name, the Nemean Lion doesn't seem to. I mean, what did they call him before he moved to Nemea? "The Lion"? As the son of god/monster Typhon and his lady/snake bride Echidna, this makes this fearsome feline a sibling of some of mythology's greatest monsters: The Sphinx, Cerberus, The Hydra, Chimera, and others. The goddess Hera (Greek mythology) has essentially played "Godmother" to most of Greek myth's great monsters, including the Lion of Nemea. It was Hera who first begged Gaia and Tartarus to create the god/monster Typhon, who happens to be the Lion's father. Hera, angry at her husband Zeus, sent the lion to Nemea to live, where there just so happens to be a shrine to Zeus. Thus anyone wanting to worship Zeus would have to get through a gigantic, almost indestructible lion first. 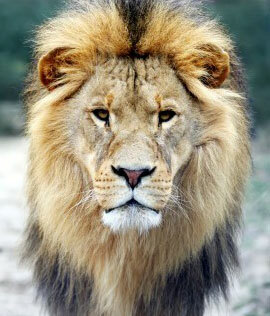 This was a problem for the people of Nemea, who couldn't kill the lion nor keep it from killing them or their livestock. The Nemean Lion was said to be twice the size of a normal lion, so you can imagine that it had quite the appetite. In the first of his trials, Hercules (Greek mythology) is tasked with finding and killing the monstrous lion. Upon finding it, Hercules shoots it with arrows, which do nothing but make it really, really mad. This is approximately when Hercules figures out that the lion's hide cannot be pierced. Being Hercules (Greek mythology), he decides to make a mad dash at the Lion rather than run away. The lion runs into its cave, which has two entrances. Long story short, Hercules blocks off an entrance, rushes into the cave, hits the lion over the head with his club hard enough to stun it, then proceeds to strangle it to death with his bare hands. In order to prove his victory, Hercules (Greek mythology) is supposed to bring the pelt of the Nemean Lion back to King Eurystheus (who had tasked him with killing the lion in the first place). Hercules tries to cut the pelt off the lion's body before remembering that it's still impenetrable. After trying a few different tactics, he finally figures out that the only thing that can cut the skin of lion is its own claws. Eventually he is able to use the claws to skin the lion. He brings the pelt back to Eurystheus but ends up keeping it to use as his own personal armor. This is where the story supposedly connects to the Constellation Leo myth. It is repeatedly mentioned in different versions of this story that either Zeus (Greek mythology) or Hera (Greek mythology) decide at this point to create the Leo constellation. Why they do this doesn't seem to be either understood nor all that important to the mythographers. Most legends assume that this is done as an ode to Hercules, but if that is the case, why is the Nemean Lion the one that ascends to the stars, which is typically reserved as an honor? For a more complete explanation, check out my article on the Constellation Leo myth. The Lion of Nemea's story is short, but important. He was the first of the trials of Hercules (Greek mythology), child and brother to some of legend's greatest monsters, and possibly lives on in a constellation. He was said to be adored by Selene, the moon goddess, as well as Hera, who is said to have placed him among the stars. Return from Nemean Lion to the List of Mythical Creatures.